The safety of marijuana is often a hot topic of debate, especially regarding it’s suitability as a health supplement. 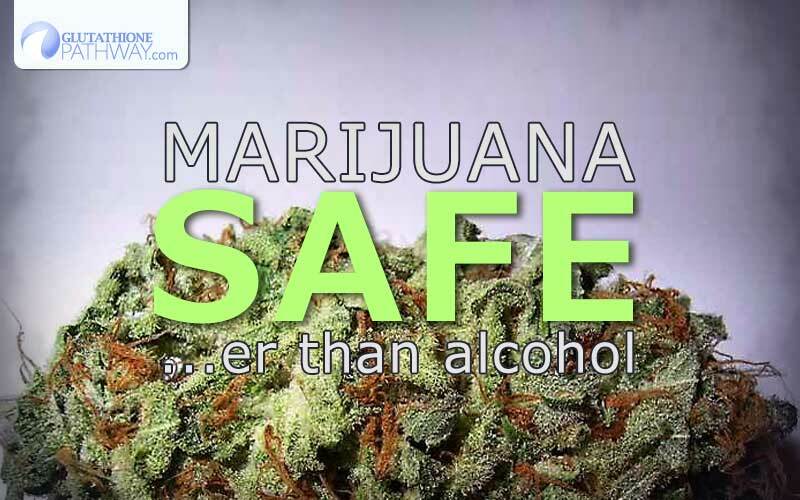 A new study is suggesting that marijuana is significantly safer than either alcohol or tobacco. This research should force regulators to re-think their stance on the criminal nature of the so called healing herb. The study with a long winded title of “Comparative risk assessment of alcohol, tobacco, cannabis and other illicit drugs using the margin of exposure approach” attempted to quantify the actual risk of death associated with each substance. It’s no surprise that drugs can be dangerous, and deadly when misused. The data from this research is a re-affirmation of existing research that sheds how hilariously out of touch the regulation of substances can be. From absolute most deadly, to least deadly, in order…. You got it, alcohol carries a higher risk of death than heroine. In fact the first 4 listed, including tobacco would be rated “high risk”, while the notoriously evil star of “breaking bad”, methamphetamine begins to fall into only a medium risk category. The statistics on Cannabis on the other hand show it really even be on this list. It proved roughly 114 times less deadly than booze. From alcohol to meth, the list above is all within an understandably small margin of difference. Tobacco being the first to ‘jump’ and be slightly safer than the top three, ecstasy and meth another jump to being slightly safer… then Cannabis shows itself and completely wrecks the scale with it’s numers. It may not outright kill you, but that doesn’t mean it’s entirely safe. There are many studies suggesting there are risks of mental health issues especially associated with high frequency of use, and the age at which you begin using it. Essentially a developing brain is more susceptible to damage from a psychoactive drug, no surprises there. This type of study mostly forces us to rethink the legal and moral stance we take against certain topics and substances. Proving it almost arbitrary. Recently we’ve found sugar may be more damaging to the health of your liver than alcohol, alcohol is more deadly than heroine, yet marijuana can get you thrown in prison and cookies with high fructose corn syrup line store shelves. Assuming moderate usage is safe in a fully formed human brain what kind of health benefits can we expect to gain? Claims of medicinal benefit from marijuana users have been prevalent for years. With it’s relative safety recently confirmed in the study mentioned you might wonder what ways you can improve your health with marijuana. There are reports and claims of muscle relaxation, evidence for marijuana helping social anxiety, slowing Alzherimer’s disease, even helping those suffering from irritable bowel. The benefits of any substance that improves relaxation and lowers stress, thus potentially lowering inflammation, are prolific. Often with supplementing and glutathione we discuss how managing inflammation is the key to mitigating many health issues. Marijuana may have some serious play in lowering stress levels and improving your health. Backed by studies in the 1970’s from the National Eye Institute. It was found that marijuana could help in decreasing pressure inside the eye thereby helping to slow the progression of glaucoma that often leads to blindness. A 2003 study using rats that were given marijuana extract and synthetic marijuana found that cannbinoids are able to help control seizures. The active ingredient of marijuana THC, helps control the brain cells related to excitability. As any pot smoker will tell you, it certainly effects the cells responsible for relaxation. A report in 2007 suggested that cannabidiol (again THC) can turn off a specific gene called Id-1 that is prolific in cancer, part of the reason it spreads to aggressively. Breast cancer patients treated with the cannabidiol managed to decrease Id-1 gene expression and making the spread of cancer less aggressive. Where Can You Legally Smoke Marijuana? With evidence of the relative safety of marijuana coming more to the forefront it’s becoming harder and harder for regulators to justify it’s criminal classification. Countries around the world are decriminalizing or outright legalizing possession in certain instances. Netherland, North Korea, Uruguay and Germany but only by permission of their Federal Institute of Drug and Medical Devices. The list above is as of February 2015 and comes from wikipedia, they have a beautiful table of countries with current legal status of marijuana and we expect more of the red countries to turn yellow and green (decriminalizing and legalizing) over time! Asking the internet if it uses recreational marijuana is an invitation for trouble, what we’d like to know is if you have a story of the health benefits of marijuana for loved ones or close relatives in your life? Has someone you are close to received significant health benefits from smoking medicinal (and legal) marijuana?